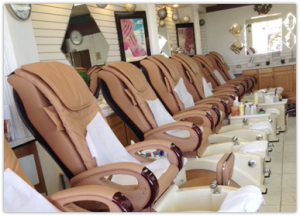 At US NAIL & SPA, our goal is total customer satisfaction. Conveniently located at 1138 E Draper Pkwy, Draper, our beautiful salon is open, airy, elegant, and easy to find. Here, customers can relax and enjoy outstanding service provided by our professional, skilled, friendly staff. To ensure the highest standards, we only use clean and sterilized tools and provide new files, pumice, and buffers to every customer. We offer a wide variety of services and dozens of polish colors so you can achieve any unique look you desire. Although our price are affordable, our services and skills are above the rest ! Come visit us for a relaxing, professional spa experience today. We are anxious to serve you!